So, I was just cleaning out my garage yesterday and I decided to put everything in their place. I been thinking about doing something with my snowboards. However, the snowboard mounts are pretty expensive. After reading a bit on the internet, I decided to do it myself. So it is really simple and it works great. So for materials, 2 sheet rock screws and some electrical tape. I just wrap the electrical tape around the head of the screw and then screw the screw in to the wall with the electrical tape exposed. Then simply slide the snowboard in between the two screws and there you have it. A very low profile snowboard wall mount. 1) My original idea and design. 2) Sheet rock screw with the electrical tape on one side. 3) Place the screw around 11 inches or the with off your board. 4) Slide the board in between the two screws and it should hold. First the week before, we received some amazing snow dump in our regional mountains, so on Saturday, my friend Colin and I headed up bright and early in the morning for Crystal Mountain for some powder skiing!!! We rode up to Crystal with Patty and met up with Lawrence and friends. This is one of the few time that I actually hike up to a run and really enjoying it. I have to say Northway is the bomb!!! 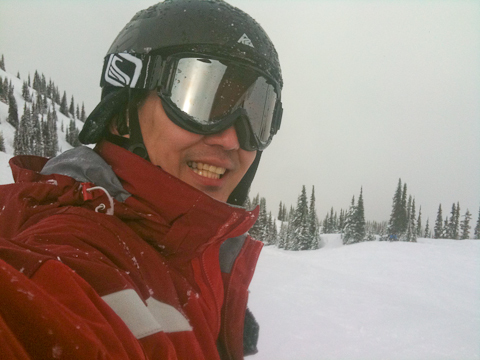 The knee deep powder field was amazing… riding super past through the field and tree then down the cliffs and back to the lift.. oh … we did that for about 3 times. It was an amazing day. 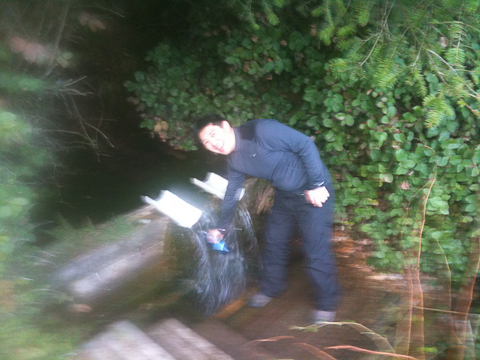 Afterward, we stopped by a spring on next to mile post 34. 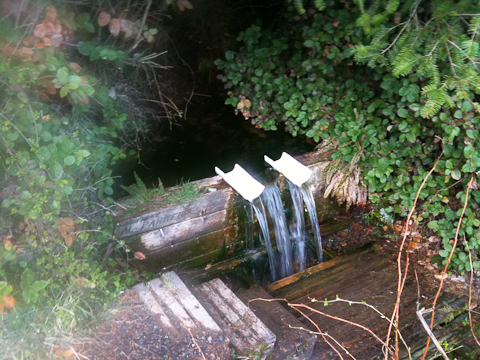 Fresh spring water with a hint of beaver pee… ha ha ha . Sorry … my lens fogged up in my iphone… but don’t worry.. the iphone is ok.
Sunday was another interesting day. I was super sore from the day before. I cooked some breakfast and was ready for a full day at home and then maybe go to the gym. However, the weather was so nice that I decided to go and join my friend for a hike up Mount Si. I looked up the stats on Mount Si and figure that oh it is only 4 miles … I should be fine. Oh was I wrong. After 6 hours later we made it up and down the mountain. The 4th mile up to the peak was covered in snow and we had to find making sticks to help us up. Eddie, the yellow lab, was a really great encouragement and I think he really helped us get up the mountain. Thanks eddie. Afterward, we all went to a Korean BBQ place in Bellevue for some quality time with friends!! 🙂 I think I will start hiking more. I think it will really help me to reach my health goals. 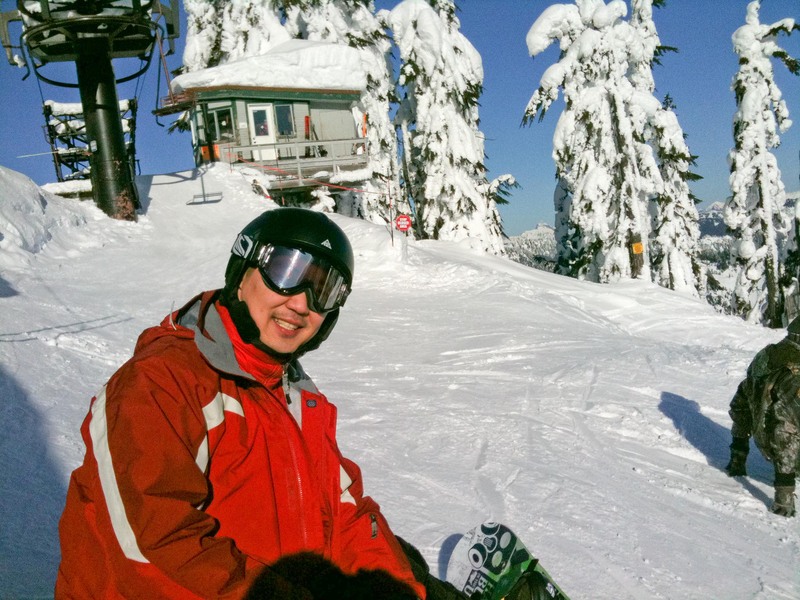 Yes this morning I did feel better but I had a commitment with the Seattle Auburn Club on a snow day trip so … on a beautiful Saturday I am out on the slops. It was an amazing day, it was also my first trip really gone out into the back country. It sucked. I hiked for over 30 minutes in knee deep snow and then I was tripping left and right coming down on the bad snow. But the view was amazing. All in all it was a great day and my lungs really cleared up. 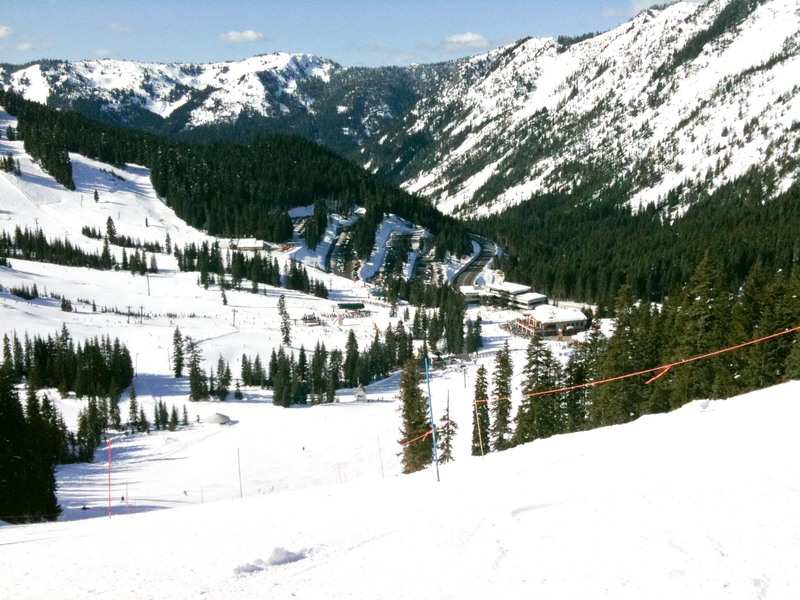 On 7th Heaven on a blue bird day! !